Us locals are used to it and love it anyway, but it’s around this time of year that the rest of the nation starts getting a little cocky. And to keep them in line, we’ve got a roster of must-do summer events that show we still live where they vacation! From an entire two months of cheap spa treatments and dining deals, to stadium concerts, July 4th parties, fruit festivals, dance weekends, EDM laser shows and more, here are some of the best things to do in July and August in Miami. Get that massage you’ve been waiting for. This summer, hit up one of Miami’s luxury hotel spas and rock the “new” robe and slippers you’re pretending 100 other people haven’t already used. Miami Spa Month is the beautiful time of year where $200+ massages, facials and other treatments start at just $109, and you can usually squeeze in hotel pool access, too. Spice up your summer dining. Back again for the summer, Miami Spice is what Miami foodies train for all year long. During this two-month stretch, hundreds of the Magic City’s top restaurants (including some of the priciest) offer three-course lunches, brunches and dinners at set prices the everyday Miamian can actually afford. Eat more Tex-Mex than you can handle. Doral’s newest addition to Miami’s Tex-Mex scene will open a second location in Kendall this summer, bringing Miami’s worthy Tex-Mex restaurant count to a solid… well, two. Be one of the first 50 in line at its grand opening shindig, however, and you could be eating its made-from-scratch “big as yo’ face” burritos for FREE for a whole year. Get “Star-Spangled Awesome” at The Wharf. Miami’s hottest outdoor bar/food truck venue/hangout/whatever the hell someone decides it should be that day, The Wharf, is throwing its first-ever July 4th party. Running from Noon to Midnight, expect music by Kid Nemesis & Friends and food and drinks from Garcia’s Seafood Open-Air Fish Market & Raw Bar, King of Racks BBQ, CRACKED by Chef Adrianne, Spris Artisan Pizza, MOJO Donuts and more. Kids are only allowed in before 6pm--then the real party starts. Because nothing screams “freedom” like throwing money down for a horse race, pigging out at a buffet, drinking outdoors and then ceremoniously shooting fire into the air just because it’s ‘murica. Celebrate the country’s 242nd birthday at Freedom Fest, where there will be Thoroughbred racing, family activities, giveaways, entertainment, a casino, some kind of fire-breathing dragon, face painting and trackside fireworks. Nothing says Father’s Day like classic cars, cigars, and a beer garden. All of those are at The Barnacle, where some of South Florida’s coolest classic cars are on display, with a cigar roller and brews-aplenty. Admission is only $2. Though the entirety of Miami's rainy summer is perfect for checking out our new Museum of Debatable Facts, June 21 kicks off its LIVE@Frost Science lecture series where science communicator Cara Santa Maria will be speaking in the planetarium about the science that goes into movie-making, along with prominent local scientists. Though our city’s favorite prix-fixe dinner extravaganza is still a month away, check out what Paula Da Silva has planned at Artisan Beach House, as well as chefs from TATEL and Lightkeepers as they preview their Miami Spice dishes. The first Sunday of every month, Hyde is having a nighttime pool party where the Champagne-spraying action starts after the sun goes down and shots are served via snorkels. Leave the grilling and beer stocking to someone else as you enjoy July 4th fireworks from a comfortable seat on a golf course. A $99 ticket gets you a full BBQ spread as well as all the beer, wine, iced tea, and lemonade you can drink. Charity 5Ks are great, but running a 5K then immediately transitioning into gigantic electronic music dance party is an event better suited for Miami. Nike brings the Electric Run to town, where you’ll run through the night-lit city, ending with perhaps the healthiest rave you’ll ever attend. Maybe you can’t make it to the MLB All-Star Game or Home Run Derby, but you can catch the guys who’ll be playing in it in the future, plus celebs and legends playing softball, and a Flo Rida concert at All-Star Sunday. 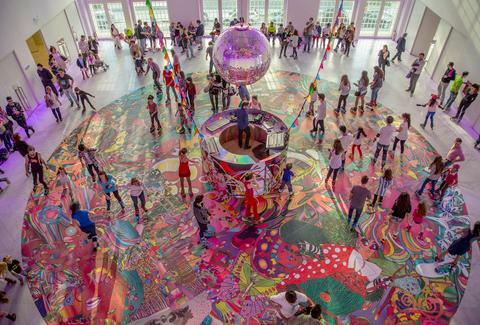 On the second Sunday of each month, the visually alluring Faena forum opens up to the public, where works of art will be displayed on the floor, and the public is invited in to roller skate over them from 12-7pm. The best part? It’s free, and there are plenty of skates to rent. Slava, the original Cirque du Soleil clown, headlines this pseudo spin-off that takes much of the comedic and musical fun from Cirque, adds in some crazy snow-inspired visual effects, and brings the whole thing to the Arsht Center stage. Ovo, Cirque du Soleil's arena show, makes its South Florida stop in Sunrise. This story revolves around a mysterious egg that shows up in a world where insects (or, more accurately, people dressed as insects) perform insane stunts while trying to figure out what’s inside. Not that a dinner party is ever a dull time at Villa Azur, but in honor of what’s basically France’s Fourth of July, it gets especially crazy. There’ll be live performers, musicians, and all varieties of French food and drinks to do the holiday properly. Nineties kids, prepare to have a nostalgia meltdown as New Kids on the Block are joined by Paula Abdul and Boyz II Men for a night that’ll have you longing to awkwardly slow dance and/or crying uncontrollably for reasons you can’t understand. Key West’s most famous part-time resident is honored all week with readings, a short story contest, fishing tournament, a 5K, a paddleboard race, and Sloppy Joe’s lookalike contest. If you’re not down for shelling out hundreds of dollars to see El Clasico, but still want to see some of the best soccer teams in the world, Paris St. Germain takes on Juventus in this International Champions Cup match. During June and July, the Miami Music Festival showcases young local musical talent all over the city. This show is the highlight, based on the Sean Penn classic film about a New Orleans nun who corresponds with a death row inmate. It’s that time of year, where you can try those places you’ve been meaning to hit all year, when over 200 of the city’s best restaurants offer prix-fixe menus for $39.95 per person. Drinks, mostly, not included. For those who know that Jerry Garcia isn’t only a play on a Ben & Jerry’s flavor, the City of Miami honors the legendary Grateful Dead frontman with a concert featuring two sets from tribute band Unlimited Devotion. The last time Guns N' Roses played Miami, it was at the Orange Bowl... which has since then beer torn down and rebuilt at Marlins Park, which is where Axl, Slash, and the rest of ‘em will be firing it up. Even if you were born after their last album came out, this show is not to be missed. Figure skating is impressive even in non-olympic years, and some of the best from all over the world will be competing at the Miami Open Championships in Kendall. The celebrity chef behind one of Miami’s hottest restaurants is hosting a cooking class, where guests will learn how to make the raw fish delicacy known as crudo, with variations from all over the world. And yes, you absolutely get to eat them after. That lord of all things Miami comfort food we call the Burger Beast is hosting his annual Croquetapalooza and Frita showdown, where 20 of South Florida’s best restaurants compete. There will also be a frita eating contest open to the public, if you really hate your stomach. Beer festivals in Miami sound like a lot of sweat and probably even more rain. But here, breweries from all over Florida (and the rest of the country) can ignore the elements and serve up samples in a pleasant, air-conditioned environment. With Mark Richt showing he can actually win a bowl game, anything is possible this year for the University of Miami Hurricanes who kick off their 2017 campaign against the always dangerous Bethune-Cookman Wildcats. Matt Meltzer is a contributing writer to Thrillist whose favorite summer event is speeding through school zones. Follow him on Instagram @meltrez1.